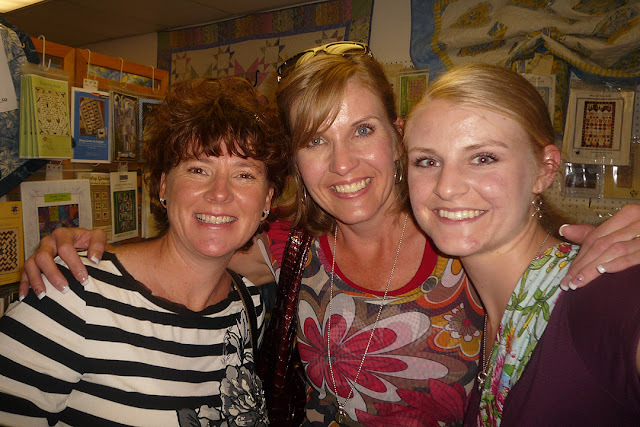 I have two people to thank for giving me my start in the food photography business, Carol (above, in the middle) is one of them. We have a mutual friend, and with his suggesting, she gave me a chance and it worked. 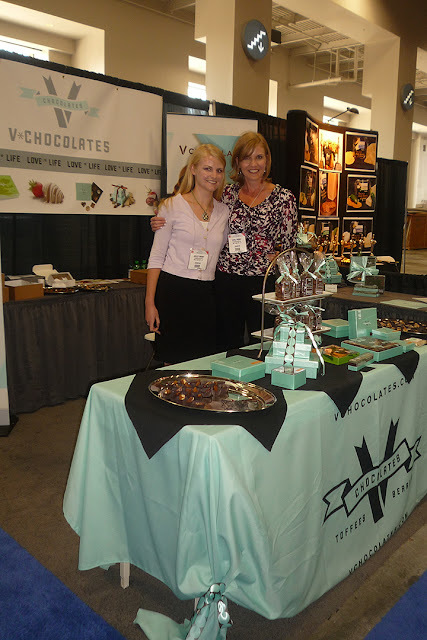 We have formed a great friendship and I have been lucky to take pictures for their chocolate company, V Chocolates in Salt Lake City, UT. Moving from Utah was sad because I would no longer be able to ride bikes, run, go to lunch, text ALL day long, quilt, shop, etc....are you starting to see that we did a TON! I knew that our friendship would never fade but it's different living so many miles apart to DO things. Well, I was so surprised to hear that Carol and her daughter, Ashley, were coming to town for the Fancy Food Show in DC. I was able to see them several times during their visit. Saturday I got the chance to show them some of my favorite places. We had so much fun! We visited a quilt store in Annapolis, went shopping at Crate and Barrel and headed downtown to historic Annapolis. This is the town that is home to the Naval Academy. It is filled with history, beautiful row homes, a dock, brick buildings and CRABS. Neither of them had ever had the experience of eating a crab that was served to the table with it's eyeballs still in tact. We laughed. The larger the crabs the more details you see. 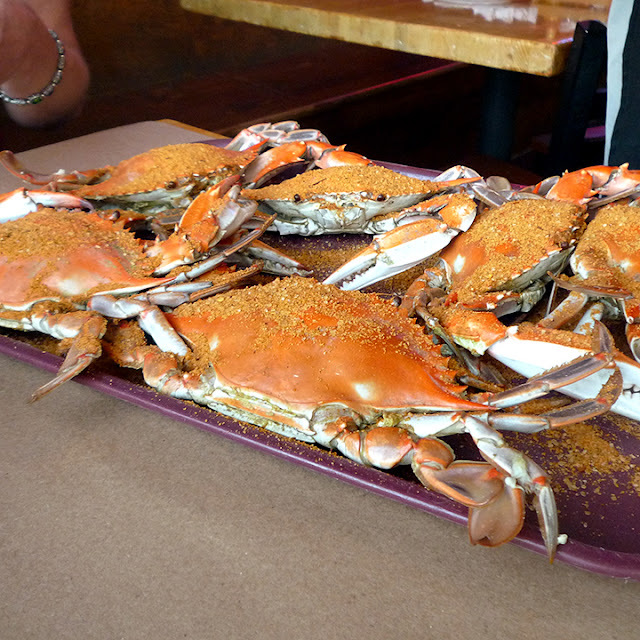 My first experience, we went with the smaller crabs, and I don't remember eyeballs..LOL When in Maryland, you have to try the crabs! I woke up the next day wanting more crab...it's that good! We started off with 6. You just don't know if people will enjoy the experience of opening the crabs, removing the mustard and stuff, then trying to get enough meat out so that you don't leave hungry. 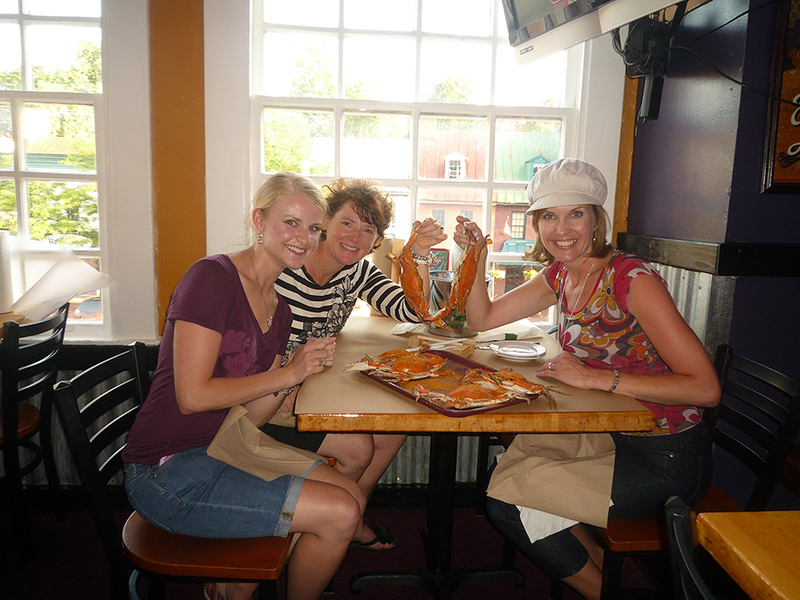 I have to say that the large or larger crabs provide plenty of meat for 3 women, with drinks and one order of sweet potato french fries. We ended up ordering another 6. We were all pro's by the end of the night. With minor cuts to a few fingers we walked away with a smile, a fun memory and full tummies. 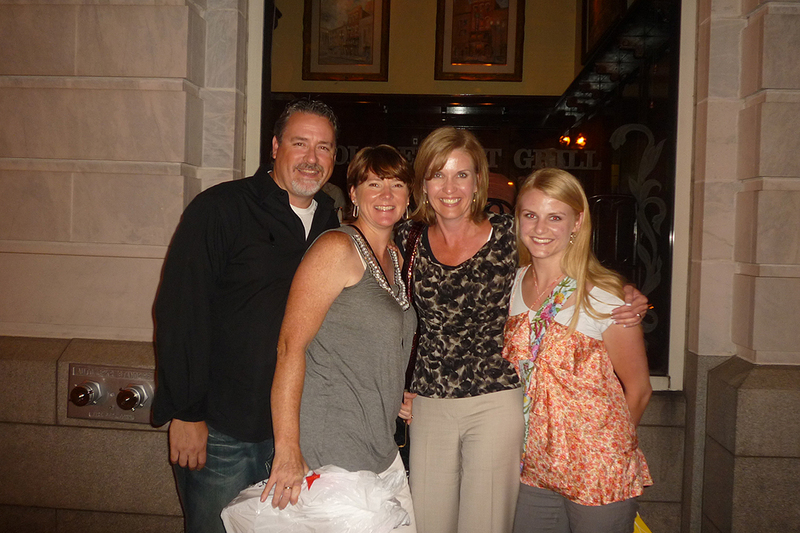 Our fun did not end with our day in Annapolis. We met Monday night for dinner at a great restaurant in downtown DC across from the White House, Old Ebbitt Grill. We ate and ate and ate..LOL Food is our friend! The conversation was so full- filling. When I can leave a meal with a full tummy, have had excellent conversations and never want the night to end....that's the perfect dinner! Their days have been filled with The Fancy Food Show. This event is amazing to attend ,if you ever get a chance, I would suggest trying to go. My first time was in NY (woot, woot...I love NY) anyways, they are doing some renovations and have moved it to DC for 2 years. Next year it is here again. I went down on Tuesday for a few hours. 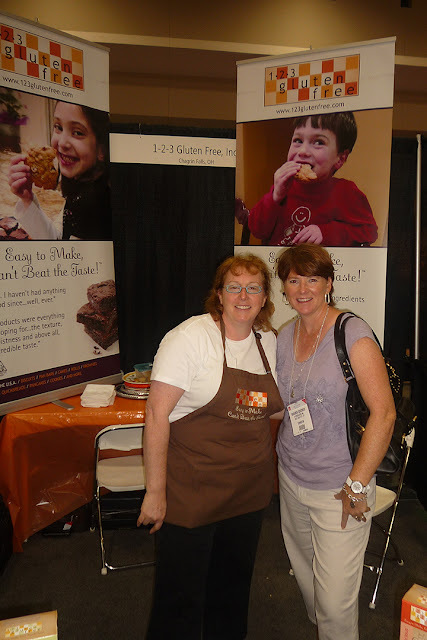 I wasn't sure what I was going to do, other than I wanted to visit several booths of gluten free products that I had used in the past. I visited Dr. Lucy's, 123 Gluten Free and Hodgson Mill....AND, the cheese section. Me and my cheese. 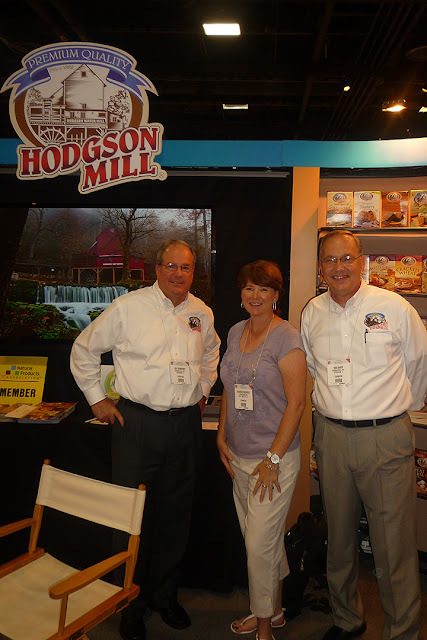 I had a chance to get some product to try from Hodgson Mill and talk to them about the new items they have coming to the market. I can't wait to try some of the samples and get back to everyone about how they perform. It's not everyday that you get to talk to the owner of a company and thank them for producing good GF items. Thank you Bob! Carol and Ashley at the V Chocolate Booth.